Source Optimized DNA sequence encoding rat GRO-beta CXCL2 mature chain was expressed in Escherichia Coli. Molecular weight Native rat GRO-beta is generated by the proteolytic removal of the signal peptide and propeptide. The molecule has a calculated molecular mass of approximately kDa. Recombinant GRO-beta is a disulfide-linked homodimeric protein consisting of amino acid residue subunits, and migrates as an approximately kDa protein under non-reducing and reducing conditions in SDS-PAGE. Biological Activity Determined by its ability to chemoattract rat neutrophils cells using a concentration range of-100 ng/ml. Presentation Recombinant rat GRO-beta/CXCL2 was lyophilized from a.2μm filtered concentrated (1mg/ml) solution inPBS, pH.4. 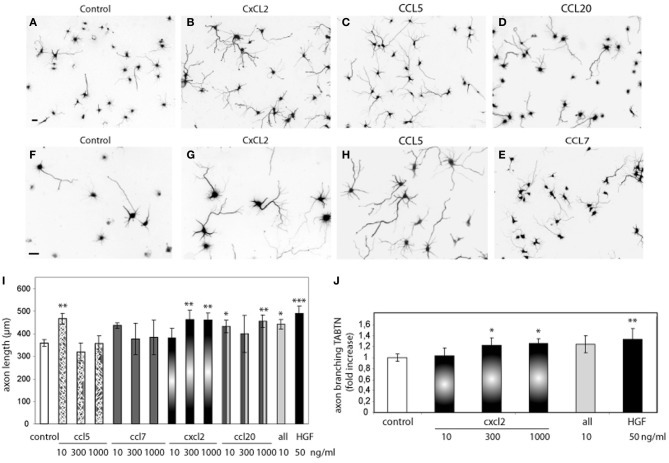 Recombinant chemokines increase axon morphogenesis. Hippocampal neurons (2 DIV) control or treated with CXCL2, CCL5, CCL20, and CCL7 (1000 ng/ml) and immunostained for βIII-tubulin to reveal the axon morphology.